This is Minnie Martin, my mom's mom's mom, known to me as Mom Mom. Isn't she just the cuuuutest little flapper you've ever seen? I've decided I have to dress up on Halloween as a flapper now. ;) I do so love costumes! Yes, I know I said I would never shop at Pyramid Collection again, but why is it that they have to have such awesome stuff!!!??? When Marie arrived to work that evening at the diner on Sixth Street, she’d planned on serving the restaurant’s patrons their dinner not becoming someone’s dinner herself. ...it's because I've had a craptastic week! Sunday, we came home from my parents. We had a great time with them, but it's a four hour drive, and I've discovered Finn is none too fond of riding in the back where he can't see me on long trips. He screamed most of the way down there, and only didn't scream on the way back because I got on the floor in the back wedged between the seats and the dog crate (I removed the very back seats to fit the dog crate in) letting him play with my hair - it's a dang good thing my hair is like waist long or that wouldn't have worked at all - and talking to and tickling him. So after four hours of that, I was ready to come home relax maybe start some laundry and have a good afternoon of nothing but relaxation. Why not celebrate the 4th in an ADORABLE holiday apron?! 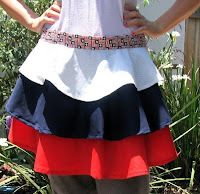 Vixen over at Apron Frenzy has some amazing, one of a kind aprons for your perusal. And why not do more than peruse? Why not buy one!? Me: *cringes and prepares to swerve out of the turning lane as the big truck coming toward us in our lane finally gets back on his side of the line when he looks up from whatever the hell he was doing on the floor* You dumbass, maybe you should watch the road!!! Nicky: *from the back seat* Mommy, was that guy a dumbass? I'm also GOING to do strength training this week. I have such a hard time making myself do it! I dunno what my problem with strength training is. Oh well, I'm gonna get the heck over it! I'm down a total of 35 lbs now. Yay me! I'm two pounds from my first mini-goal. It's the weight I was when I got prego with Nicky. All of these are not actually Lean Cuisines. Some of them are smart ones. Lean Cuisine Chicken Tuscan - This one wasn't something to write home to Mom about. There wasn't a lot of flavor and what their was wasn't that great. I like that there are more veggies in the dinnertime selections, but these were lacking a great deal of flavor. I really wish they'd get some more dinnertime selections because they don't have many and what they do have aren't that exciting. Lean Cuisine Sausage, Egg, and Cheese Breakfast Panini - I couldn't find this one on their site so there isn't a link. I had high hopes for it, but it fell short. The bread had a kind of sweet cinnamony flavor to it. I didn't like that combined with the egg and sausage flavors. Okay, so most of my plants were starting to get mad about being contained on the front porch. So I made them their own little raised garden. I'm going to do the whole square foot gardening thing next year probably, but I didn't do a grid or anything this year. Some of the plants are still on the front porch. And the Zucchini is still doing SMASHINGLY in the Topsy Turvy. I love this thing! Remember that this poor little Zucchini was almost dead when I put it in here. Here is the only one of my peppers that is actually making peppers... I planted three. Two made blooms and one just dropped the blooms and didn't bother with fruit. I'm not sure what the problem with the other one is. It hasn't even tried. And here is the CUUUUTE little baby pepper it's making! Wow, have I been living under a rock? Why haven't I heard about this?! I'm feeling very accomplished today! Okay, I'm kinda an obsessive planner in all situations, but when it comes to trips I'm even more so! So on with my obsessive planning. My parents are going too, and they picked out an awesome beach house. So that part is all taken care of. Alright...so I was a bit on the bored side, and I like playing games with google. So I was typing in some of my characters names to google to see what happens. Markus Patrick Luebke Jr's Facebook page.